Day 14: I wrote 0 words for the NANO book (6,241 words total for all my fiction). 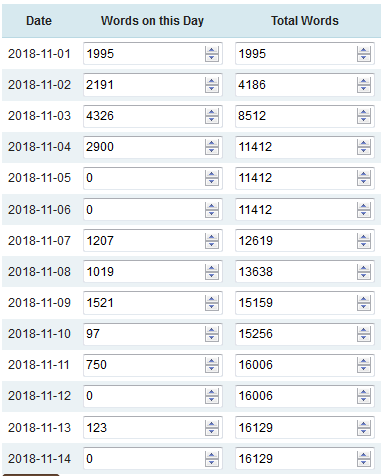 But as you can see in the screenshot below, my NANO word counts have suffered quite dramatically because of this focus on ending my other book. However, I do believe I can catch up. The book is still moving along swiftly when I work on it, and I don’t feel any particular anxiety about how things are going. Fingers crossed. Then I realized I was getting started much later than I needed to for my original plan to work the way I wanted. It’s 11:03 am. I need a new plan. I’m going to stick with the 4 blocks but swap up the number of sessions for each one. This is both a challenge and an experiment. 21 minute sessions seem to be a good length for me and doing a few of them in a row doesn’t feel like a push I can’t handle. Doing four blocks of them might be, but I’m not going to know if I don’t try. I really want to reach this 6,000 words in a day milestone. In fact, it’s part of a bigger challenge I want to set to finish this book I’m working on in 9 days. Today is the test to see if I’m anywhere near ready to take on something like that. My next post will contain my updates on today’s challenge. I said last night I’d begin the challenge to reach 6000 words in a day again today, but I’ve decided to hold off one more day. I need to get rid of this headache I’ve got, so I think I’m just going to fiddle around with those paperbacks I never finished up. I’ll probably try to write something today at some point, but maybe later, and probably not much. I made it past 4000 words again. But I am done. More than nine hours of writing went into those words and I’m finally just pooped. I need to get on a better pace for this to happen. I’m taking a day off the challenge tomorrow and the next day, then I will try again. Well, I’d made it less than two digits away from 4,000 words when it came time to delete some more random pieces of writing at the end of my document. I’m now back down to 3,575 words, after a possible record breaking 8 hours and 39 minutes of writing. It’s possible I’ve spent that much time in a day writing before, but without records I can’t know for sure. I find it difficult to exceed 50% efficiency when it comes to actual writing time versus time in general and since a full day is 16 hours, more than 8 hours of writing time is actually pretty damn fantastic. And I have definitely been writing all day, with Gleeo to prove it. I lose little bits of time here and there to breaks and interruptions. Mostly because I actually can’t sit still for too long before I go stir crazy, and all those five, ten, and twenty minute breaks really add up. I am not a person who can sit and start typing and look up three hours later and realize it’s been, hey, three hours since I moved. I’m at 2,048 words. I’ve been writing for 4 hours and 17 minutes, or as usual, all damn day. My breaks have been sporadic and uncontrolled, mostly because it’s Saturday and the house is not empty of anyone but me. Still, it’s only 4:25 pm and I could get on a roll. This has been a difficult book to write. I’m not sure why. At the moment my brain is trying to resolve a plotting issue that’s driving me crazy. Time to get up and get started. If things continue as they have I need a good 14 hours of writing to reach 6000 words today. Let’s just try for 7.5 hours again but 800 words per hour this time, why don’t we? Not sure what the deal is but my pace on this book has been insanely slow. Still, halfway there is an improvement! I need things to turn around. Right now I’m at 1,723 for the day, after 4 hours and 11 minutes of writing. Not, sadly, after 4 hours and 11 minutes. It’s taken me from 10 am to 5:55 pm to get those hours. Still, if my pace were to increase, it’s still possible to hit 6,000 today, right? I’ve been writing today, a lot, except it doesn’t really feel that way, because of the afternoon hour and my word count for the day. I really shouldn’t have gotten up so late. My word count is 1,230. Meaning my pace is off and it’s going to take a lot of hours today to reach 6,000 words. I’d better get back to it quick then. I got up ready to get started writing, but of course I was still having issues with the thing that stopped me last night. It took me hours to get past it this morning. It’s 7:10 pm and I’ve written 1,093 words today. Not great, as you can see, but I’ve done worse. And as for the thing, well, I can say honestly that I am finally over it and the writing is going pretty well all things considered. I’m not going to have to scrap the 4000+ words of material I was afraid I’d have to scrap if the pieces of the story didn’t join up where I’d gone back and taken things in a bit of a different direction. I just need to make a few changes to account for that change of direction for the parts that happen afterward that I had already written, and I think it’ll be okay. It’s shouldn’t require much adjustment, just a timing issue mostly. After a strong(ish) start this morning, the day has fizzled. Dentist visit went well, and I got home and decided to make an early supper so I could have a longer evening of writing, but that didn’t work out. Writing has turned out to be difficult because of a message I received just as I was finishing supper. Unfortunately, I have a tendency to obsess and sure enough I started obsessing. I haven’t been able to let go of the thoughts that message set into motion and that’s killed my ability to concentrate. I took some time out to talk with one of my kids and watch Border Security on Netflix, because it’s wild and weird and I like it. But within moments of returning to the computer, the obsessive thoughts started again. Googling (or Binging, is that a word?) “how to stop obsessive thoughts” didn’t turn out to be the answer, surprisingly. All I can say is that this tendency is why I try never to read reviews, because this is exactly how I’ve felt afterward, obsessing over stuff that just does not matter. So, I don’t know if this was the right thing to do, but I deleted some email addresses off my mobile devices, because that’s where I saw the message. Of course, I went ahead and deleted all related addresses from my devices (I have quite a few addresses) because it made sense in context. If my devices hadn’t been set up to check those addresses (pretty needlessly, I might add), I wouldn’t have seen the message at that time because WiFi was off on my computer. Then I wouldn’t have become distracted from writing by the obsessive thoughts. Maybe I would have turned on WiFi and checked my email client later, before I was finished writing, but at least I would have had the chance to restart and recover my momentum from this morning before I was derailed. I feel lighter after doing that, although I admit it was an impulsive decision. Maybe having access to everything all the time just isn’t for me. Compartmentalization of the various parts of my life might be more my style. This could take all month! Yesterday, unfortunately, I really underestimated how long the taxes thing would take. I left at 11 am and returned at 4:30 pm. By the time I ate an early supper, it was 5:30 and I was so brain tired I had a difficult time even thinking about getting started again. I came not even close to 6,000 words yesterday. Today I am at it again. It’s 10:23 am, I’m about to go make my hot honey lemon water for a boost, and I’ve already spent 1 hour and 20 minutes writing. Sadly, that’s added up to a very paltry 107 words! I am so off my pace I can’t even understand what’s going on. Last night, I had a 52 minute stretch where I averaged less than one word per minute when all was said and done. I know I wrote more than that, but it was write, delete, write, delete, write, delete until all I’d done was increase my word count by 50 words. I just cannot figure out why my pace is so bad on this book. I’m dealing with SO MUCH hesitation with everything I write for it that I’m spending TONS of time editing/cycling through/rewriting as I go. I just can’t get a handle on it. I have a dentist appointment today that’s really going to mess up my day, but I’m going to do my best to finish out the day with 7 more hours at 842 words per hour. For that to happen, something’s really going to have to break loose soon, but I am ever hopeful. I failed on many levels yesterday. I have a headache this morning so maybe I’m getting sick, but I didn’t have one yesterday so it’s not a good excuse for yesterday’s failures. As for the headache, the sun is rising earlier, daybreak is already here at six in the morning and I’m waking with the sun again. Staying up, even until eleven thirty to midnight is obviously not working for me now that the morning light is getting stronger. I just can’t thrive on six hours of sleep anymore. Haven’t been able to do it in quite a few years, tbh. Tonight I will call it a night around nine thirty and try to be asleep by ten thirty. Just going to have to make myself do it. Today I go help someone with taxes but I’m still going for 6000 words today because I think I can do it. I’m going for breakfast, and then it’s writing that I shall do. Basically, this isn’t an update. Well, technically, it is an update, but it’s an update to say I don’t have anything to update. Despite my plans for the day, it’s 8:06 pm and I’ve written about a nib’s worth of words. I guess it’s gonna be a long night, because I’m not going to bed until I’ve at least kept my >1,000 words streak alive. I can say with certainty that today will not be a 6000 word day. It’s 11:09 AM and I’m ready to start now, after a delay I should have expected but for some reason didn’t. There are lots of options for completing this challenge, but considering the time, I’m going to have to hope for this one: 750 words x 8 hours. Writing faster will be as important today as writing more, it turns out. I’d hoped differently, but I probably should have realized it was a Monday when I wrote my first post this morning. Monday mornings are difficult because my college bound kid spends it getting ready to head out for the week and I spend the morning distracted. Now to recover, turn off WiFi, and get myself back into a writing groove before I let the day slip away. If I count the words I deleted yesterday (which I don’t), my word count was in line with the previous four days of this challenge to reach 6000 words. Meaning today is day six of the attempt. I have to do some stuff differently today, because yesterday was my worst day for time logged since I started the challenge. On the one hand, taxes filed. Done. Complete. Yay. On the other, almost three hours fixing a Windows error that was having no effect on my ability to work whatsoever. I’m going to try focusing on the accumulation of time today instead of worrying about the words. We’ll see how that goes. I’m afraid I’m going to lose some words today. The current material is going too far afield of the scenes I’ve already written. I had hoped they would join up but now it’s not looking good for that possibility. I’m at 965 words for the morning and I’m still trying to reach 2000 before lunch. That’s with 2 hours and 5 minutes of writing. I’ve been careful of breaks but obviously I’m still losing time somewhere. I got started at 8:36 and it’s 11:15 now. Back to the book. Too much to do to tinker.